Brattleboro, Vt. -- The Strolling of the Heifers (SOTH) invites the public to a Harvest Tasting on Friday, November 3, 2006 to celebrate local agriculture and kick off SOTH'S "Buy Local" Challenge. The Gallery Walk Night affair will take place from 5 to 8 pm at the Robert H. Gibson River Garden on Main Street in downtown Brattleboro. The public is welcome to stop by and savor local food samples, ranging from New England buffalo burgers and potato au gratin to apple pie and maple milk shakes. Dwight Miller Orchards; Lilac Ridge Farm; Peaked Mountain Farm; Robb Family Farm; and Taylor Farm. The following organizations also will offer farm-fresh produce: Brattleboro Food Co-op, Kindle Farm, Valley Ridge School, Vermont Cheese Council, Vermont Fresh Network, and Slow Food USA. Area restaurants, including Amy's Bakery, Capers, Chelsea Royal Diner and Riverview Café, will provide samples created from local produce. Food fans will also learn the names of the Local Roots Recipe Contest Winners (and perhaps even taste samples!). The younger generation won't want to miss the fun-filled kids' activities led by SOTH's Dairy Godmother Amelia Struthers. Another event highlight will be music by Ned Phoenix and Friends. Ned will perform on fiddle with Alan Partridge, guitar, Colin Blazej, bass, and Gerry James, percussion. The public will have the opportunity to sign up and make their personal pledges to "Buy Local" at the event. The goal of the 10-month "Buy Local" Challenge is to educate area residents about the benefits of buying locally and increase their purchases of local food. The "Buy Local" Challenge will be supported by public-awareness building through print, radio and retail advertising. Sponsors of SOTH's "Buy Local" Challenge include Agency of Agriculture, Food & Markets; Vermont Community Foundation; Windham Regional Commission; Building a Better Brattleboro; Gallery Walk; Brattleboro Reformer; and WKVT. 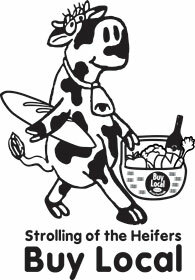 The mission of the Strolling of the Heifers is to promote awareness of the importance of agriculture in our daily lives and to raise money to fund educationally oriented agricultural programs for youth. See www.strollingoftheheifers.com. for details.